If you have read a few of my posts or know me then you already know traveling is my EVERYTHING. So with that being said, I want to share my latest gift to myself…luggage. I know some of you are saying what?!?!? I have been stalking this luggage brand for months and months. When I first saw the luggage on Instagram and went to their website to get more details the price scared me. It has been at least 3 or 4 years since I have purchased (what y’all know about BELK department store) so I really didn’t know how much a piece of luggage should cost. Somewhere between staring at the luggage and reading many reviews, I had made the decision that I wanted them both. I also convinced myself that my travel life would be so much easier and that isn’t hard to do. AWAY is my new brand of choice for luggage. On the site, they offer a variety to choose from in colors and sizes. The luggage has both TSA approved ejectable battery (ability to charge your phone 5 times) and combination lock. I purchased the bigger carry on because I was in the market for a new bag that had compartments for organization and more space to pack. The previous carry on I was using was very very small. This bag has a sleeve for your laptop or iPad attached to a compression system for easy packing and, detachable waterproof laundry bag. What more can you ask for??? I know… someone to actually help pack but trust me you will enjoy packing this bag. AWAY luggage provides a chart for the 2 carry-on options they offer. The chart shows you exactly which of the 2 carry on bags the airlines will accept according to their measurement restrictions. I also purchased the everywhere bag. This is great as an airline personal item, long weekends and overnight trips. It can be secured to AWAY carry on luggage for easy movement throughout the airport. The everywhere bag also has a built-in laptop compartment. 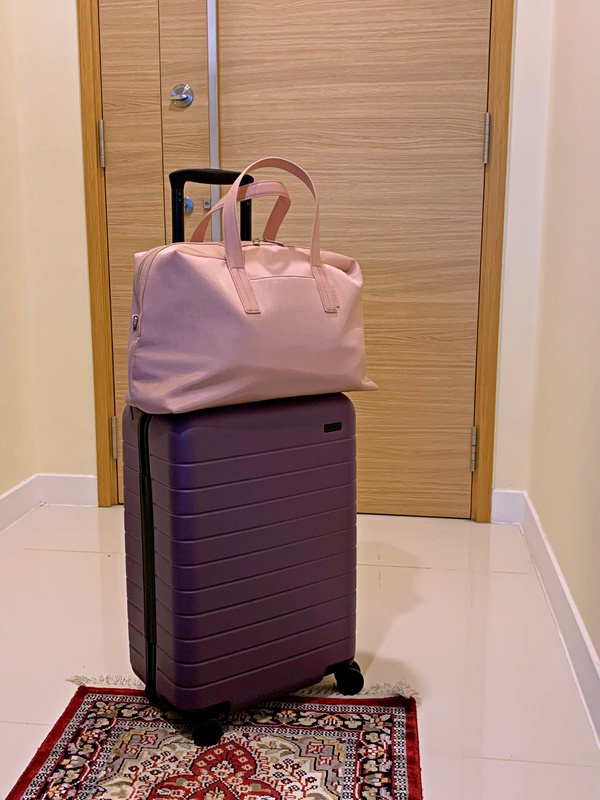 I really really like this luggage and I am planning to purchase the larger luggage in the near future. Even if you don’t travel often I say purchase or add one of these items to your wish list. With the lifetime warranty and return policy, you can’t go wrong. One last thing, Nordstrom is doing a pop-up shop with AWAY and offering spring colors. until February 24, 2019. If you own an AWAY piece let me know in the comments what you have. Nice! I didn’t realize the travel bag was also by Away. How does it compare to the larger overnight Longchamp bags? I have the Longchamp bag that is larger via horizontally. My Longchamp bag I use for a quick road trip that is overnight, 2 days at the most. I would choose this one because I know I’m packing shoes and clothes only no electronics, magazines or other things I travel with on longer trips. The Everything Bag by Away has A LOT of compartents in the inside. So I use this bag to better organize my electronics and whatever else I may have. I wouldn’t carry The Everything Bag by Away as an overnight or weekender bag because I don’t pack light. My Everything Bag has to be paired with another bag or piece of luggage if I’m going on vacation. Absolutely. Very detailed explanation, thanks for the comparison!